Just got back from an amazing holiday in Bali. My husband and I were finally able to go on a honeymoon (after 3 years of being married) and we wanted a very relaxed trip to de-stress and unwind. Bali, being a top tourist destination, is actually bigger than you think. People from all over the world go there to immerse themselves in the culture, relax in a tropical paradise, go on adventures, party, practice yoga, surf, and so on. WHY you choose to go to Bali will then dictate which area of Bali you should go to. For us, we were there to sightsee, to relax, and get pampered for cheap (read: getting as many massages as we can!). 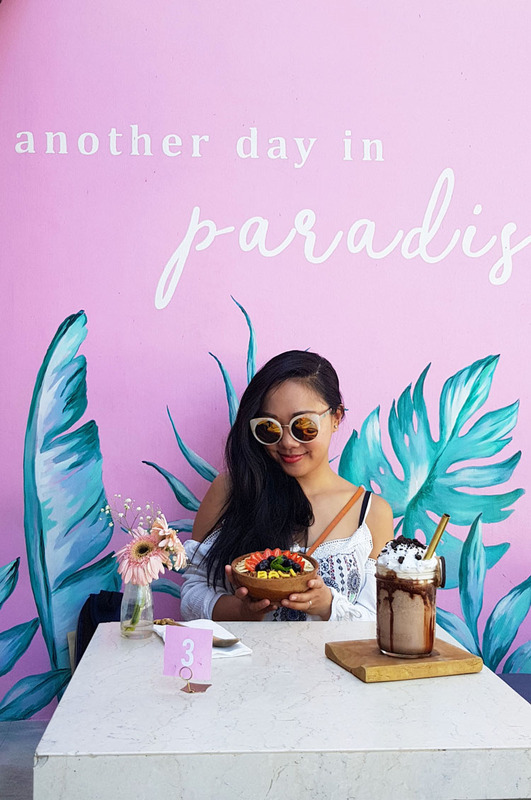 With this in mind, I chose to divide our 8-day Bali honeymoon and spend it in Seminyak and Ubud (Ubud blog post coming soon). 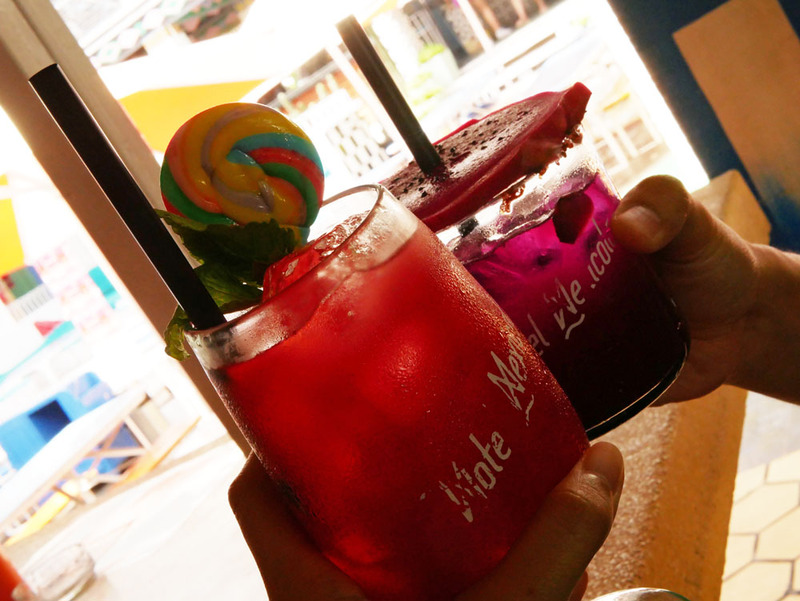 Note: While the majority of this itinerary can be done and dusted in 1-2 days, we were there to RELAX and take it easy. Therefore, a relaxed itinerary it is! My husband was really looking forward to taking a break from working too hard and the last thing I wanted was for him to feel like he needed a vacation from our vacation. Bali, after all, is a tropical paradise and that's exactly what I wanted the whole trip to feel like - a paradise. We landed and checked into our hotel, Tony's Villas and Resort, the night before and were greeted with lovely welcome drinks. Got up and had breakfast which was our first taste of Balinese cuisine. Yum! We then walked to Potato Head Beach Club. You will know you're there when you spot their Instagrammer's favorite wall where you can shoot your OOTD of course. You will find that most online sources will tell you to get there by 11AM as it tends to get quite packed. So we were there by 930am. Apparently, they don't open until 10am. We were, however, able to book our choice of day bed because we were early. To enter the club and swim in the pool is free (for the thrifty folks here, you can opt to do this). 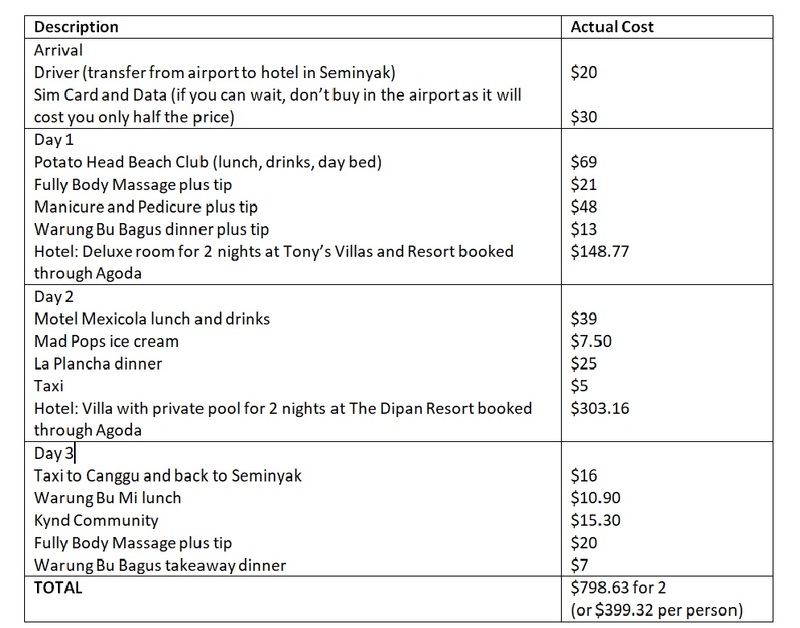 However, to book a day bed requires a minimum spend of IDR 500,000. We chose to get a day bed and spent on food and drinks. By far the most expensive meal in Bali for this whole itinerary but well worth it! We jumped into the infinity pool, had some drinks at the pool bar, and lounged in our day bed where we also had lunch. Food was delicious too. 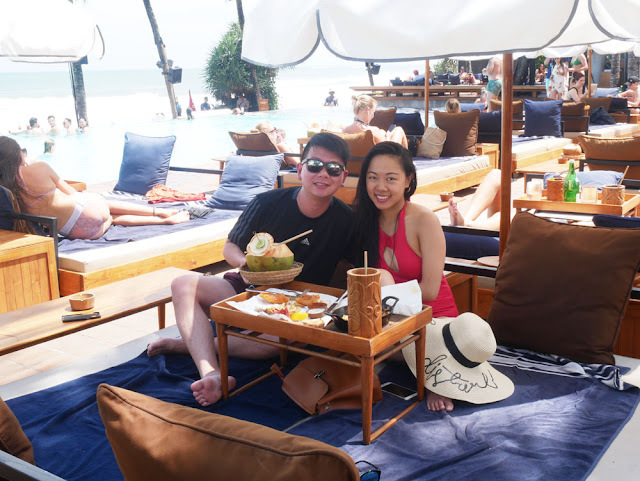 While we could have saved $70 and just entered for free, choosing to spend some money to take all the time we wanted in the pool and just lay lazily comfortably on our day bed eating good food, set the tone for our whole trip. This was day 1. And we were in paradise. After that, we went back to the hotel to shower then walked around Seminyak, looked around Seminyak Village Mall, got our first massage for the week followed by manicure and pedicure ($8.50 for a full body massage? Yaaaassss), then had a delicious but crazy cheap meal at Warung Bu Bagus, then called it a day. We began Day 2 with a morning swim at the hotel's 2 swimming pools followed by breakfast before checking out and transferring to a different hotel closeby. I chose to spend 2 nights at a cheaper hotel to be able to afford 2 nights in a villa with a private pool all to ourselves. We had lunch at Motel Mexicola - again, this is a restaurant that you could probably opt not to spend anything at - or perhaps only opt for drinks - if you were only after those Instagram photos, but - the food was delicious and just taking your time and swaying to the restaurant's in house singers, was just lovely! We then walked to Mad Pops for some ice cream to cool ourselves down from the hot day. Mad Pops is a vegan ice cream shop which I found delicious but left my husband asking to buy "real ice cream". Lol. And guys, he really did end up buying ice cream that night. 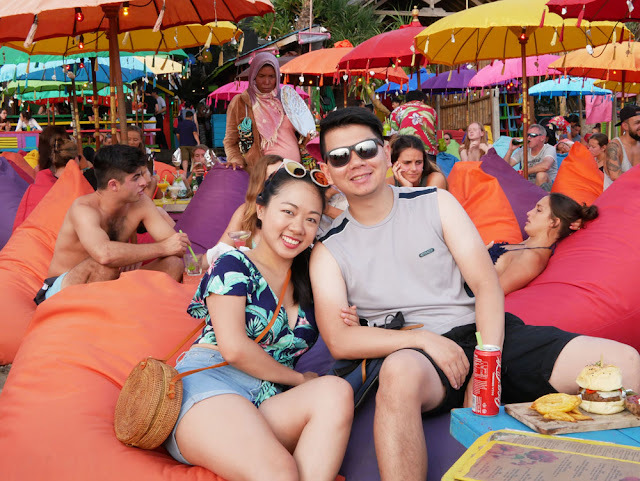 After that, we walked to La Plancha to watch the sunset while having dinner while lounged on colorful bean bags under equally colorful umbrellas, with music playing in the background. Easier said than done. The walk to La Plancha was a tricky one because of the tiny roads which was just confusing on Google Maps. Needless to say, we took a taxi home before it got dark and the party people would start to get drunk, and then we chose to go night swimming in our villa's private pool instead. Aside from looking around at some shops and checking out Love Anchor, we weren't very much entertained at Canggu and it was such a hot day so we headed back to Seminyak and had a smoothie bowl at KYND Community. P.S. The Instagram shot was not worth it. It was priced like how it would be priced in Australia, and while the smoothie bowl and shake were good, they weren't good enough, if you know what I mean. We stopped by The W Seminyak - entrance is free - but it's crazy expensive to stay there for a night. It was beautiful though - exuded an aura like Cebu's Shangri-la. After this, we just headed back to our villa for another swim (it's that hot in Bali, we swim/shower twice a day!) We then got another full body massage ($7.50 only this time!) - and then by this time, I was feeling quite ill with Bali Belly symptoms and was back and forth to the toilet overnight. Thankfully, I was more or less feeling fine and up for our transfer to Ubud the next day. 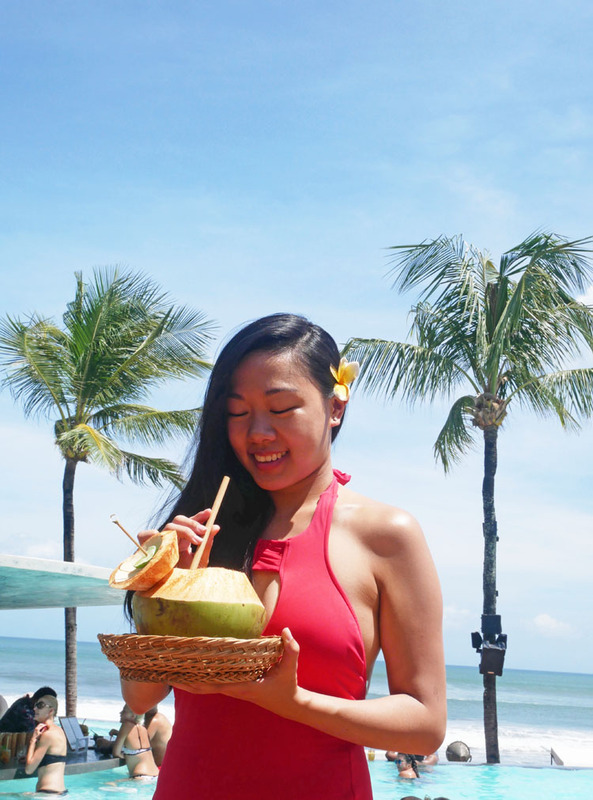 A Jeannie in a Bottle Blog travel post will always be affordable without sacrificing comfort. And for this trip, I made sure to include some luxury too! Because where else could you afford to live like royalty for a few days? If on a tighter budget, the "unnecessary" expenses are easy to skip! 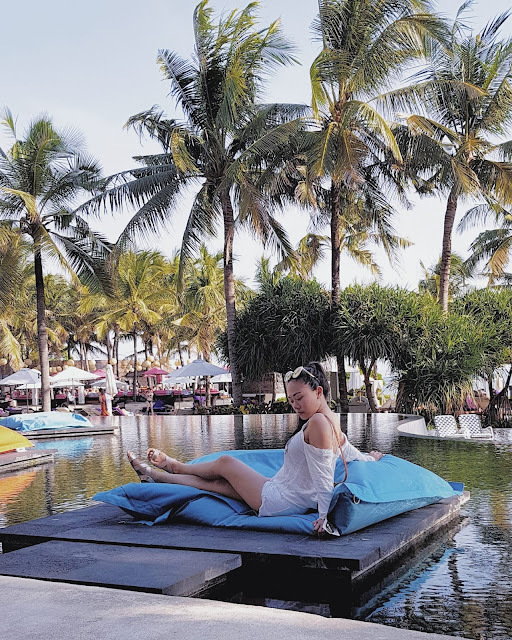 My favorite part of this Seminyak itinerary was starting out the trip lounging on a day bed at Potato Head Beach Club, feeling the summer vibes while music played, swimming in the infinity pool and just KNOWING that this is the start of my week-long holiday in the tropical paradise of Bali. Have you been to Bali? What was your favorite part? It looks like paradise there. I love all the photos you took. It looks amazing!! And it wasn't that expensive!! glad that you finally had your honeymoon and you enjoy it very much! I love Bali and have been to Potato Head beach club just for lunch and loved its vibe. Great destination for honeymoon. Kudos to your marriage! I love seeing legal and pure married couple. Bali is one of the places I really want to visit someday. I'm glad you got to enjoy it! i wanna visit Bali too! :) Great post! 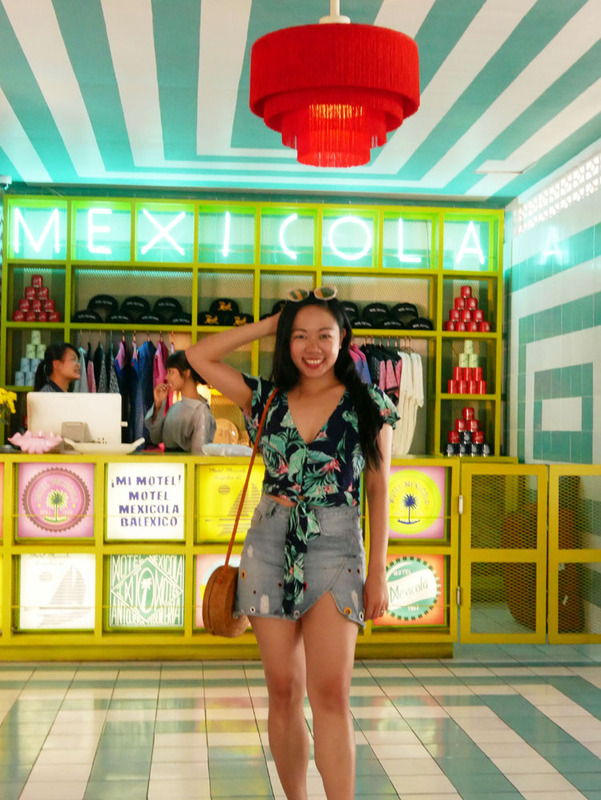 NEW POST: MI FIRST TIME IN COACHELLA!! PRIMERA VEZ EN COACHELLA!! Your trip to Bali looks absolutely amazing - those photos are gorgeous and I love all of your different outfits too! Babe, you look amazing on your swimsuits! Especially the two piece. Bali indeed is such a paradise! Looks like a really fun honeymoon/holiday. I like all your photos especially the one with pretty walls. Never been to Bali, I'm scared of the Bali belly but I like everything you've done here especially lounging in the Potato head beach. Your outfits look so good on you. this is amazing post, i love all the pictures. i really wanted to visit Bali, i wish i can go there, soon. Amazing post and lovely photos dear! I love how you included the costs, and really they are quite reasonable, for being in paradise!!! Wow these photos are incredible, Bali looks like a paradise! And I'm so happy you have enjoyed your honeymoon dear! Love your summer outfits! What a gorgeous trip! I love tropical destinations! My husband and I waited several years before we took our honeymoon and it def. still felt like a honeymoon when we finally did take it! I guess I just love him that much more now. :) I'd love to go to Bali someday! Nice trip. Lovely pictures lovely place. Wow, this looks like the perfect honeymoon! Amazing photos! How wonderful you finally had your honeymoon after that long time! I see you enjoyed Bali really and I see it is worth to visit this island. Thanks for sharing your experience and all the wonderful pictures with your beautiful looks! Ben and I have been DYING to get to Bali! We're planning to go next summer. All of this makes me so excited to go! I will seriously be getting a massage EVERY day (that's not a joke haha). I also love all of the fresh food, but Bali Belly does NOT sound like fun. Thanks for the heads up on that. I can't wait to hear about Ubud! This looks like an amazing honeymoon. Congratulations! The private pool sounds like it would be so romantic. Those views are amazing dear! Beautiful place and I definitely love the outfits. I'm so jealous, it looks like the perfect getaway and trip!!! So inexpensive too! It really looks like a paradise!!! I wish I had a chance to go there, it's absolutely amazing! I've seen many of photos of Bali and Maldives and I loved all of them. What an amazing honeymoon spot- so glad you guys got to go + enjoy! Bali is on the top of my travel bucket list for such a long time. I love it, it's an amazing post I really enjoy, have a lot of fun ! always always love Bali! hope you had a great time! 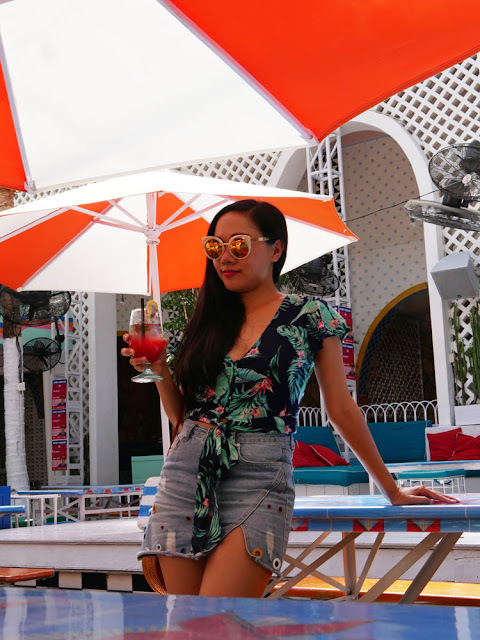 Love the post and your style while on vacay!! New post in my Lifestyle Blog ! No I have never been to Bali, but your trip and photos make it sound and looks so fun. And you looked great throughout. Maybe the shakes were not the best but what a fun shot! Hi! I'm Jeanne - a Cebuana by heart but now based in Adelaide, Australia. 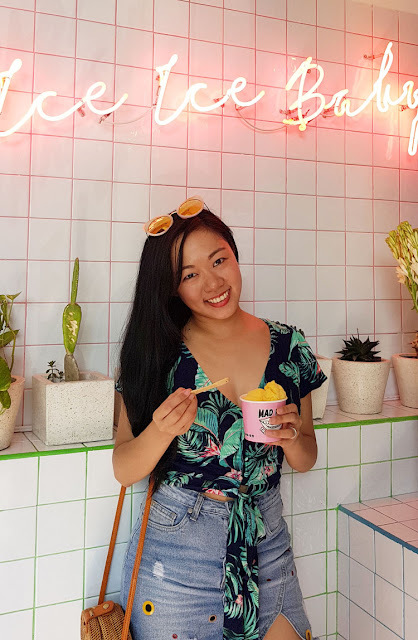 Join me in my journey as I discover my new home and share with you my fashion choices and travel adventures along the way. All photos are my own unless otherwise stated.. Awesome Inc. theme. Powered by Blogger.